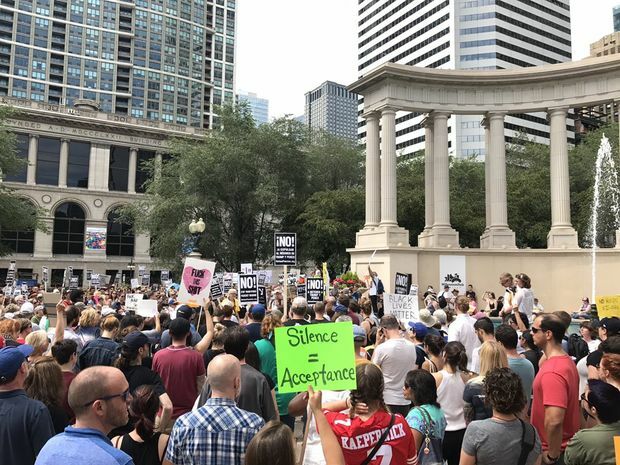 Demonstrators against racism rally Sunday in Millennium Park in the wake of the deadly violence Saturday in Charlottesville, Va.
CHICAGO — A day after white supremacists clashed with anti-racist demonstrators in Charlottesville, Va., leaving one woman dead and dozens injured, Chicagoans on Sunday gathered Downtown to condemn racism and bigotry. Two Virginia state troopers responding to Saturday's clash also were killed in a helicopter crash. President Donald Trump has been lambasted for failing to condemn white supremacists in his initial response to Saturday's fatal violence, instead criticizing violence and bigotry "on many sides." Hundreds of people, including a group called Refuse Fascism, gathered at Millennium Park at Randolph Street and Michigan Avenue and marched to Trump Tower for a "Chicago Stands With Charlottesville" rally. "We must mourn, and we also must organize," organizers wrote on Facebook. "We must show that right wing hate, racism and violence will not be tolerated. Solidarity is needed." Organizers of the Women's March in Illinois held a vigil in solidarity with Charlottesville at Federal Plaza, 219 S. Dearborn St. The effort was to "come together as a community to heal, to reaffirm our commitment to protecting each other's lives, to defending each other's rights and freedoms and to continue our struggle for an America that loves and welcomes us all."